In the spiritist session of November 15th of 1908, presided by Jose de Souza, in the headquarters of the Spiritist Federacy of Niterói, in the state of Rio de Janeiro, a series of strange facts happened: Spirits, that said to be of black slaves, natives and children had incorporated the house mediums, in a way that breached with the Kerdecists practices: asking for candy, tobacco and alcohol. These spirits were, then, invited by the president of the service to leave the place, warned about their state of spiritual retardation. Then the young man Zélio Fernandino de Moraes, then only 17 years-old, that was attending this sort of service for the first time, was dominated by a strange force, that made him to spoke without him knowing what he was saying. It was the voice of the ‘Caboclo Sete Encruzilhadas’, that, out loud, refuted the thesis defended by the president that those deceased were spiritually delayed due to their ethnic background or to the social class they belonged when living. In the 17th, in a street called Floriano Peixoto, number 30, in Neves, Zélio opened the first Umbanda Center of Brazil: the house of Nossa Senhora da Pìedade. 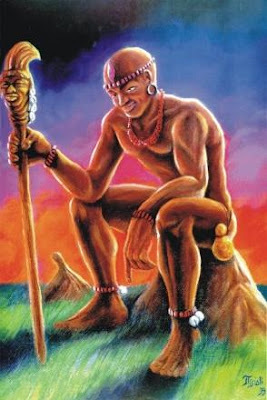 At 8 p.m. as promised in his first appearance, the Caboclo Sete Encruzilhadas manifested himself in Zélio and declared that, at that moment, a new cult was being initiated, where the spirits of old African men - that did not find field of activity in the kardecism nor in the Candomblé - and the native indians of our land could work in benefit of their incarnated brothers, despite of color, race, creed or social condition. (1) Umbanda was established! The Umbanda is a religious-philosophical cult developed basically in Brazil, mixing African mythology and some of the practices of candomblé, myths of the native Brazilian and Christian concepts - with influence from the catholic church as well as from Kardec´s spiritism. The Umbanda workship the Orishas, but with a different status that is given in the Candomblé. In the first one, mediuns incorporates ' guides' , the spírits of the dead, that function as messenger of gods, the orishas, which never have direct contact with the living creatures. Yet in the Candomblé, the ritual incorporation is of the Orisha himself over his 'son-of-saint' , excusing an intermediate, and even not recommending to any living creature to be incorporated or to be influenced by spirits of deceased. Thus, there is currently in the Umbanda, many degrees of aproximation and distanciation of two very antagonistic poles: the cult of the Candomblé and Kardec’s spiritism. And, clearly, inside of these extreme limits – the 'table' and the 'nation' - the movement pro Umbanda is extremely cosmopolitan and anthropophagous: there is the esoteric umbandas, influenced by occultism, by eastern religions, by astrology and by several contemporary spiritual practices. According to its adepts, the word "Umbanda" itself does not have African origin but drift from sanskrit mantras ‘Aum Bhandan' (3). However, generally, we could say that the Umbanda is summarized in five creeds: the belief in the existence of only one God, that is almighty, everlasting and uncreated; the belief in spiritual entities on a higher level of development - orishas, angels and saints - as well as entities still in evolution - eshus, black old man, children, caboclos - that work as intermediates between the superior entities and the world of the living creatures; the belief in reincarnation and the law of cause and effect (Karma): and the belief that the Man is a synthesis, a miniature of the Universe; and, mainly, the belief in the mediumnic practice, under the most varied forms, as a way to alliviate one´s own karma and the karma of others. That is why, as the poetry of the chants from the cult summarize, " Umbanda is charity". (1) Information from the work of the researcher Thereza Saidenberg.